TACLOBAN CITY – Fishery production in Eastern Visayas dropped by 11.9%, from 35,029 metric tons (MT) in the third quarter of 2017 to 30,865MT in the third quarter of 2018. All provinces registered decreases in fishery production, except Biliran, the only province that recorded a slight increase of 1.8% from its level of production in the same quarter in 2018. Eastern Samar recorded the highest decrease of 25.7%, from 7,128MT in the third quarter of 2017 to 5,294 MT during the quarter in review. Among provinces, Leyte produced the highest volume of fisheries at 9,291 MT, comprising 30.1% of the total fishery production in the region. Samar ranked second at 8,447 MT, accounting for 27.4% of the region’s total fishery production. Southern Leyte, meanwhile registered 1,222 MT, the lowest volume of production which shared 4.0% only. By subsector, volume of production in commercial fishing went down by 19.5%, from 3,755 MT in the third quarter of 2017 to 3,024 MT in the same period in 2018. All provinces registered decreases, except Leyte and Biliran, which recorded increases of 6.6% and 4.8%, respectively. Southern Leyte recorded the highest decrease of 66.8%, from 264 MT in the third quarter of 2017 to 88 MT during the quarter in review. Similarly, volume of production in municipal fishing (marine and inland) registered a decrease of 12.0%, from 20,351 MT in the third quarter of 2017 to 17,919 MT in the same quarter in 2018. Among provinces, Leyte, Southern Leyte, and Biliran registered growths in production of 5.1%, 4.6%, and 1.2%, respectively. However, the increases were negated by the decreases recorded by Eastern Samar (24.9%), Samar (13.4%), and Northern Samar (5.0%). Volume of production in aquaculture also declined by 9.1%, from 10,922 MT in the third quarter of 2017 to 9,923 MT in the same period in 2018. All provinces registered decreases, except for Southern Leyte, which recorded an increase of 194.7%, and Eastern Samar, which had retained its volume of production at 6.3 MT. TACLOBAN CITY – The chicken industry in Eastern Visayas posted 18.1% increase in production during the third quarter of 2018. Based on the preliminary data, the total chicken production in the region went up to 14,280 metric tons (MT) in the third quarter of 2018 from 12,092 MT in the same quarter last year. Region VIII accounted for 3.3 percent of the country’s total chicken production during the third quarter of 2018. It ranked seventh among the regions with low chicken production in the country. Meanwhile, as of 1 October 2018, the total chicken population in Eastern Visayas stood at 3,268,844 birds. This registered a decrease of 2.9% from its 3,365,703 inventory as of 1 October 2017. Among provinces, Leyte recorded the highest number of chicken at 1,695,155 birds, which comprised more than half or 51.8% of the total chicken population in the region. Samar ranked second with 555,440 birds, which accounted for 17.0% of the region’s total chicken inventory. Eastern Samar, meanwhile, registered the lowest inventory of chicken with 3.9% share or 128,157birds. By type, layer chickens stood at 464,849 birds as of 1 October 2018. This posted a significant growth of 24.0% from the 374,853 inventory as of 1 October 2017. All provinces registered increases except for Leyte, which recorded a decrease of 5.1%, and Eastern Samar, which had the same inventory of 5,000 birds from 1 October 2017. Southern Leyte posted the highest increase at 77.4%, from 55,013 birds as of 1 October 2017to 97,586 birds as of 1 October 2018. On the other hand, broiler chickens decreased by 11.0%, from 1,201,372 birds as of 1 October 2017 to 1,068,950 birds as of 1 October 2018. All provinces registered decreases except for Biliran, which recorded an increase of 208.0%, and Eastern Samar, which had the same inventory of 1,000 birds in 1 October 2017. Southern Leyte posted the highest decrease at 81.4%, from 73,962 birds as of 1 October 2017 to 13,780 birds as of 1 October 2018. Similarly, the number of native/improved chicken went down by 3.0% with a total inventory of 1,735,045 birds as of 1 October 2018 from 1,789,478 birds as of 1 October 2017. All provinces registered decreases except for Eastern Samar, which recorded an increase of 1.2%. Southern Leyte registered the highest decrease at 5.7%, from 325,804 birds as of 1 October 2017 to 307,234 birds as of 1 October 2018. More than half or 53.1% of the total chicken population in the region were native/improved chickens. Broiler chickens accounted for 32.7%, while the remaining 14.2% were layer chickens. TACLOBAN CITY – Palay production in Eastern Visayas decreased by 7.2%, from 126,930 metric tons (MT) in the third quarter of 2017 to 117,792 MT in the third quarter of 2018. Decreases were observed among all provinces, except in Biliran and Eastern Samar, which posted an increase of 4.6% and 4.4%, respectively. Samar recorded the highest decrease in production by 28.8%, from 33,477 MT in the third quarter of 2017 to 23,837 MT in the third quarter of 2018. Among the provinces, Leyte produced the highest volume of palay at 40,721 MT, which comprised more than one third (34.6%) of the total palay production in the region. Southern Leyte, meanwhile, had the lowest volume of production (7,702 MT) accounting for only 6.5 percent. The total harvest area for palay in the region went down by 4.9%, from 35,348 hectares in the third quarter of 2017 to 33,615 hectares in the third quarter of 2018. Increases recorded in Biliran (6.4%), Eastern Samar (3.6%) and Southern Leyte (1.8%) were offset by the decreases registered in Samar (19.4%), Northern Samar (0.3%) and Leyte (0.2%). Leyte recorded less than a third or 30.8% (10,354 hectares) of the total palay area harvested during the quarter in review, while Southern Leyte contributed the least (1,646 hectares) accounting for only 4.9%. Yield per hectare for palay in the region eased down by 2.8%, from 3.6 MT per hectare in the third quarter of 2017 to 3.5 MT per hectare in the same quarter of 2018. Among the provinces, Southern Leyte posted the highest yield per hectare during the quarter in review at 4.7 MT per hectare while Samar registered the lowest at 2.9 MT per hectare. TACLOBAN CITY – Corn production in Eastern Visayas increased by 6.4% from 18,671 metric tons (MT) in the third quarter of 2017 to 19,866 MT in the same quarter of 2018. All provinces registered increases, except Southern Leyte, which recorded a decrease of 1.3%. Samar recorded the highest increase of 82.1%, from 1,343 MT in the third quarter of 2017 to 2,446 MT in the third quarter of 2018. Among the provinces, Leyte produced the highest volume of corn at 12,459 MT, comprising more than three-fifth (62.7%) of the total corn production in the region. Biliran, meanwhile, had the lowest volume of production (143 MT) accounting for only 0.7 percent. The total harvest area for corn in the region inched up slightly by 0.7%, from 13,791 hectares in the third quarter of 2017 to 13,894 hectares in the third quarter of 2018. All provinces registered increases, except for Leyte, which recorded a slight decrease of 0.2 percent, and Southern Leyte, which had retained area harvested at 254 hectares. Leyte shared 67.5% (9,385 hectares) of the total corn area harvested during the quarter in review, while Eastern Samar contributed the least (61 hectares) accounting for only 0.4 percent. Yield per hectare for corn in the region was sustained at 1.4 MT per hectare. Among the provinces, Eastern Samar posted the highest yield per hectare during the quarter in review at 2.7 MT per hectare, while Leyte registered the lowest at 1.3 MT per hectare. CARIGARA, Leyte – The Department of Public Works and Highways Leyte Second District Engineering Office poured out a total of P85 million for the construction of concrete road leading to Villaconzoilo Agri and Eco Tourism Farm and Silawa Falls. The project involves 3.5 kilometers Portland Cement Concrete Pavement (PCCP) with the width of 6.1 meters and thickness of .028 meters, including culverts, excavation and embankment. District Engineer Carlos Veloso said that the project will provide convenient access for visitors who want to experience the natural forest atmosphere and the relaxing effect of the cool and clean waterfalls. He added that this development will also open new opportunities to the whole community through the new income generating programs that will contribute to the growth of the economy. To date, the road to Villaconzoilo Agri and Eco-Tourism Farm is now accessible, however, the road leading to Silawa Falls is still underway. Meanwhile, the Payapa at Masaganang Pamana (PAMANA) has allocated also P9.85 million in addition to the road concreting works at Villaconzoilo leading to Silawa Falls. The Villaconzoilo Agri and Eco-Tourism Farm is about 7 kilometers from the town proper while Silawa Falls is located at the upper stream at 5 about kilometers away. 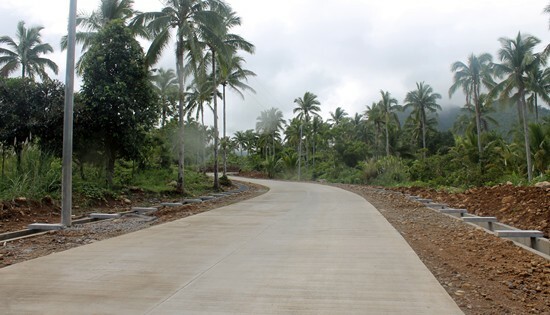 NAVAL, Biliran – The Department of Public Works and Highways (DPWH) Biliran District Engineering Office (DEO) nearly completes the construction of P32.2M access road leading to trades and industries in support of the food and resource-based processing in Sitio Kahukaw. 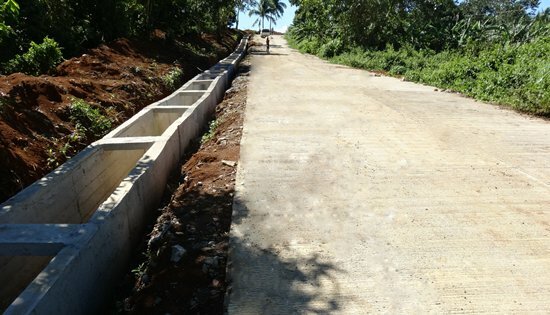 In partnership with the Department of Trade and Industry (DTI), Biliran DEO is currently implementing the concreting of 3.6-kilometer existing earth road with slope protection structure that will connect Barangay Villa Canejato Sitio Kahukaw in the same barangay in the town of Naval. David P. Adongay Jr., District Engineer said that the project was prioritized in order to bring their processed ginger powder, abaca helm, coconut-based products, and atchara to the market center in the progressive town of Naval and to the nearby urban areas. From a hilly and bumpy road, residents in Sitio Kahukaw will directly benefit the project giving them a safe travel and fast transport of their local products. Adongay said that thru better roads leading to trades and industries, more locals will be encouraged to do business that will create an additional livelihood and an additional income. Under the Special Convergence Program of the DPWH and DTI, five project are implemented for the construction/ improvement of access roads leading to trades, industries and economic zones with a total cost of P133.972M. Out of the five projects, two are already completed, while 3 are on-going. As of November 30, 2018, the construction of access road connecting Villa Caneja to Sitio Kahukaw has an accomplishment of 95%. This project is eyed for completion on December, 2018. Also up for completion are the construction of P25M access road, Villa Caneja- Anislagan Road connecting to Anislagan Ceramics Producers Association (ACPA) and the P25M National Road Junction (NRJ) Agpangi connecting to Sitio Pongon all in Naval. Meanwhile, the P30M construction of access road, (NRJ) Villa Consuelo connecting to Libtong Road and P18.9M access road, Caraycara -Cabungaan-Libtong Road are already completed. NMP trainees and employees participate in the Earthquake and Tsunami Drill conducted on 05 November 2018. TACLOBAN CITY – In a bid to elevate public awareness on how to respond in the wake of any emergency situations caused by natural calamities, such as earthquake and tsunami, the National Maritime Polytechnic (NMP) in partnership with the City Disaster Risk Reduction and Management Office (CDRRMO) of Tacloban City conducted an earthquake and tsunami drill participated by NMP trainees and employees on 05 November 2018 at the NMP Complex, Tacloban City. The activity was held pursuant to the directive from the National Disaster Risk Reduction and Management Council (NDRRMC) relative to the conduct of CY 2018 4th Quarter Nationwide Simultaneous Earthquake Drill (NSED) and Observance of World Tsunami Awareness Day on 05 November 2018. The drill started at around 10:00 AM with a one-minute siren which was meant to inform everyone inside the NMP premises that an earthquake has just occurred. All NMP trainees, employees, and guests do the “Duck, Cover and Hold On”. In an interval of ten seconds, another one-minute siren was heard, a signal for everyone within the vicinity to evacuate the building and proceed to the designated mustering stations wherein a marshall will do the head count. One “scenario casualty” was reported needing immediate medical attention. Using the NMP emergency vehicle, the search and rescue team was dispatched and was able to bring the casualty to a safe area where a cardio pulmonary resuscitation (CPR) was executed by the assigned First Aide, an NMP trainee. After the casualty was revived, the third siren was alarmed for one minute in anticipation for an aftershock, Tsunami. Everyone was advised to proceed to the second floor of the NMP Administration Building having a higher elevation compared to other buildings in the area. The exercise was terminated after the communication was established to the different responders identified by the team. "This will help us prepare ourselves when a tsunami or an earthquake hits Tacloban City," Mr. Eduardo V. Polo, Training Officer of Tacloban City CDRMMO said. "It is our responsibility to ensure that everyone are aware and knowledgeable of the things that should be done in cases of emergencies," he added. Alfredo L. Bollido (in white barong), Assistant District Engineer of the Department of Public Works and Highways (DPWH)-Biliran District Engineering Office receives the ASEAN ENGINEER certification and medal on November 13, 2018 during the 36th Conference of the ASEAN Federation of Engineering Organizations (AFEO) on November 12-14, 2018 held at the Resort World Convention Center, Sentosa, Singapore. NAVAL, Biliran – Alfredo L. Bollido, Assistant District Engineer of the Department of Public Works and Highways (DPWH)-Biliran District Engineering Office (DEO) is the first in the district office and the first in the Province of Biliran to be an accredited member of the Association of South East Asian Nations (ASEAN) Engineers. 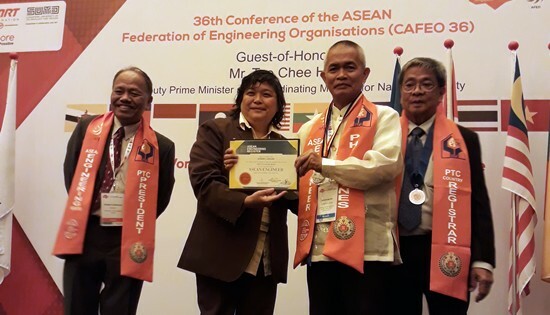 The accreditation was conferred to Bollido on November 13, 2018 during the 36th Conference of the ASEAN Federation of Engineering Organizations (AFEO) from November 12-14, 2018 held at the Resort World Convention Center, Sentosa, Singapore. The theme holds: “Engineering Rail Connectivity” and “Excellence in Engineering Education”. According to Bollido, there were a total of 150 Filipino engineers from different professional engineering organizations who were recognized as ASEAN Engineers in the recently held conference with the majority from the Philippine Institute of Civil Engineers (PICE). Other professional engineering organizations are from Geodetic Engineers of the Philippines (GEP), Society of Aerospace Engineers of the Philippines (SAEP), Philippine Society of Agricultural Engineers (PSAE), Philippine Institute of Chemical Engineers (PIChE), Institute of Integrated Electrical Engineers (IIEE), Institute of Electronics Engineers of the Philippines (IECEP), Philippine Society of Mechanical Engineers of the Philippines (PSME), Society of Naval Architects and Marine Engineers (SONAME), Philippine Society of Mining Engineers (PSEM), Society of Metallurgical Engineers of the Society of Sanitary Engineers (PSSE), and Philippine Institute of Industrial Engineers (PIIE). In the latest batch of conferment, Bollido added that he is the only one from Region VIII who received the ASEAN Engineer Award and become part of the AFEO. According to Bollido, the prestigious organization requires high set of standards and guidelines for the applicants. Bollido shared that it took him three years of waiting before his application was approved during the AFEO Mid-Term Meeting held in Jakarta, Indonesia last August 5-7, 2018. “You really have to show your competence, focus on quality and excellence on your accomplishments,” Bollido said. To become part of AER, one must have a degree recognised by the Home Institution, must be full time member of the engineering or technological association and licensed to practice in the home country and must have a minimal of 7 years post-graduate working experience in an engineering environment. “Becoming a member of the ASEAN engineer means that you are not just an ordinary engineer, but an internationally competitive engineer,” said Bollido. Opportunities of becoming an AER includes bigger market for expertise, better employment prospects, and wider networking and strategic alliances among others. AER members shall also be entitled to the exclusive use of the title ASEAN Engineer (ASEAN Eng.) after their names. The ASEAN Federation of Engineering Organisations (AFEO) is a non-governmental body. Its members are the engineering institutions and organisations of ASEAN countries with the following main objectives: To promote goodwill and mutual understanding and to establish and develop an ASEAN baseline standard for the engineering profession with the objective of facilitating the mobility of the engineers within the ASEAN countries. 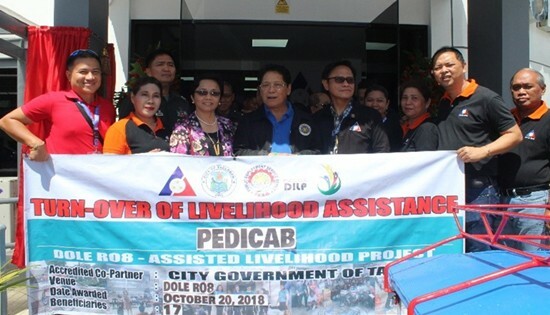 TACLOBAN CITY – The Department of Labor and Employment Regional Office VIII has released a total of P450,000.00 livelihood assistance to the local government unit of Tacloban which benefited thirty (30) small-time entrepreneurs and pedicab drivers coming from different barangays of the city. The P450K grants was the sum of the two approved livelihood projects funded under the DOLE Integrated Livelihood Program (DILP) namely “Small-Scale Resilient Informal Entrepreneurs” and “Resilient Pedicab Drivers of Tacloban City”. Thirteen (13) drivers received their own pedicabs last October 20, 2018 personally awarded by no less than DOLE Secretary Silvestre H. Bello III and DOLE-8 Director Yahya A. Centi during the Inauguration of the newly-renovated DOLE building. Secretary Bello recognized the efforts of DOLE RO8 as well as its partner, the LGU Tacloban City thru its Public Employment Service Office (PESO) for being facilitative and active in providing livelihood to the deserving beneficiaries. Mr. Danilo Pido, one of the recipients of pedicab units, was very happy to finally have his own pedicab as his primary source of income. “This pedicab will be very helpful not just to me but for my family. I am thankful to DOLE and LGU-Tacloban for giving me this blessing. 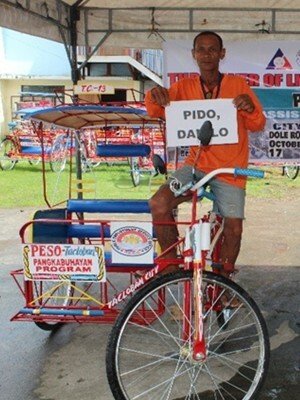 Rest assured that I will take care of this pedicab.” Pido said (in Waray-waray dialect). Meanwhile, the nego-cart units were awarded to some seventeen (17) food vendors last November 29, 2018 during a simple turnover ceremony held at Tacloban City Hall Lobby graced by DOLE-8 Assistant Regional Director Atty. Cecilio I. Baleña and Tacloban City PESO Manager, Ms. Emilia Cruz. Atty. Baleña congratulated all the deserving beneficiaries for their new nego-carts and advised them to give due care to the units. “DOLE is here to help you have better lives through our livelihood program. Our request is for you to give due care to the nego-cart so that it will really serve its purpose which is to help you earn your own income”, said Atty. Baleña during the turnover ceremony. DOLE Integrated Livelihood Program is DOLE’s contribution to the government’s agenda of inclusive growth through massive job generation and substantial poverty reduction. The program seeks to reduce the vulnerability to risks of the poor, vulnerable and marginalized workers by providing them access to a grant assistance for capacity-building on livelihood ventures either for individual or group undertakings. QUEZON CITY – “Duterte is nailing the door to peace shut with appointing retiring AFP Chief Carlito Galvez Jr. as the next Presidential Adviser on the Peace Process. What will a high-ranking military officer contribute to the advancement of the peace process when the same institution has been largely behind the derailment and collapse of the negotiations? Clearly, Galvez will turn OPAPP into the Office of the Presidential Adviser on Preventing Peace. War is business, and the military is adept at profiting from violating people’s rights,” said Karapatan Secretary General Cristina Palabay on Malacanang’s announcement of the appointment of AFP Chief Galvez as OPAPP head. Yesterday, December 5, 2018, Malacanang announced that Duterte was considering to name retiring AFP Chief Carlito Galvez Jr. as OPAPP Secretary, following Jesus Dureza’s resignation. Dureza’s resignation came after allegations of corruption surfaced, involving the Payapa sa Masaganang Pamayanan (PAMANA) program of the OPAPP. AFP’s Galvez is set to retire this December. Palabay recalled that former and incumbent military officials in the government, including AFP Chief Galvez, DND Secretary Delfin Lorenzana, and National Security Adviser Hermogenes Esperon, were among those who strongly opposed, and actively blocked, the substantial progress borne out of the peace talks. “The mercenary character of the military prevents them from understanding that peace is not merely the laying down of arms, but a condition that necessitates social justice. Peace is not “silence” as in the muting of dissent and resistance, but the achievement of societal change that lends itself to the achievement of human dignity for all. Peace, therefore, must be based on justice. The military, however, does not think like this,” she stated. The Karapatan official also slammed the corruption in OPAPP’s PAMANA programs, claiming that these have been milking cows for the military and other agencies involved in the said project. “The PAMANA budget has been largely used for corruption, recently used to fund the parade of fake surrenderees. Not only is the money funneled to the pockets of officials after community members have been falsely paraded and listed as surrenderees in official papers, the military even has the gall to use this charade to claim that their counterinsurgency program is working. The OPAPP has been instrumental not only in furthering corruption, but also in enabling security forces to commit more violations in communities. With Galvez as new head of this office, we can expect more of the same arrangement,” Palabay added. Galvez’ appointment will make him the seventh former AFP Chief appointed to key civilian positions in Duterte’s government. Among other former AFP Chiefs-of-Staff appointed by Duterte are National Security Adviser Hermogenes Esperon, DSWD head Roy Cimatu and DILG head Eduardo Año. “Duterte may think he is keeping the military in line by doling out key civilian positions to military men, but he is further endangering the Filipino people. The control of the military over communities will heighten, insidiously using civilian agencies as arsenal against Filipinos themselves. Duterte’s militarization of the bureaucracy undermines civilian supremacy. This is how the Duterte regime intends to stay in power amid widespread protest and resistance – fear and repression to be manned by a set of military men kept loyal through the awarding of political favors at our expense,” Palabay concluded.